I created my “appreciation jar” using some special items from various cupboards around our home…items that have some special significance… the brandy snifter, the very delicate glass swan, given to me 38 years ago by the mother of an incredibly loving, beautiful, joyful, precious 3 year old girl who was deaf and blind, the sugar bowl, belonged to my husbands grandmother, representing “sweetness” in life, lambs ear leaves for softness, a card, “Pause, notice, appreciate” from one of my previous posts and new, blank little appreciation “papers” in the sugar bowl, created for writing appreciations onto each day. It might be helpful to review and think about wide variety of positive qualities…qualities we often have, but might not acknowledge enough. Perhaps you might want to take some time to read carefully through this list, perhaps even print it out…to reflect on how many of these wonderful qualities you have and use….what we appreciate appreciates. After several days, I really started noticing and appreciating so many more positives from each day…. and even talked my husband into adding his own appreciations to the jar, too. 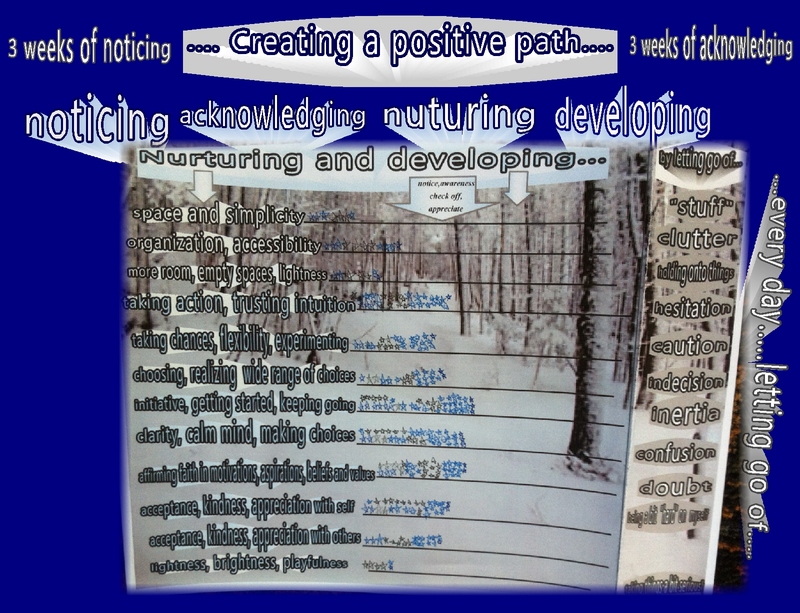 to develop and use them in more settings and situations…. Three weeks later, January 24: The “Appreciation Jar” is filling up. 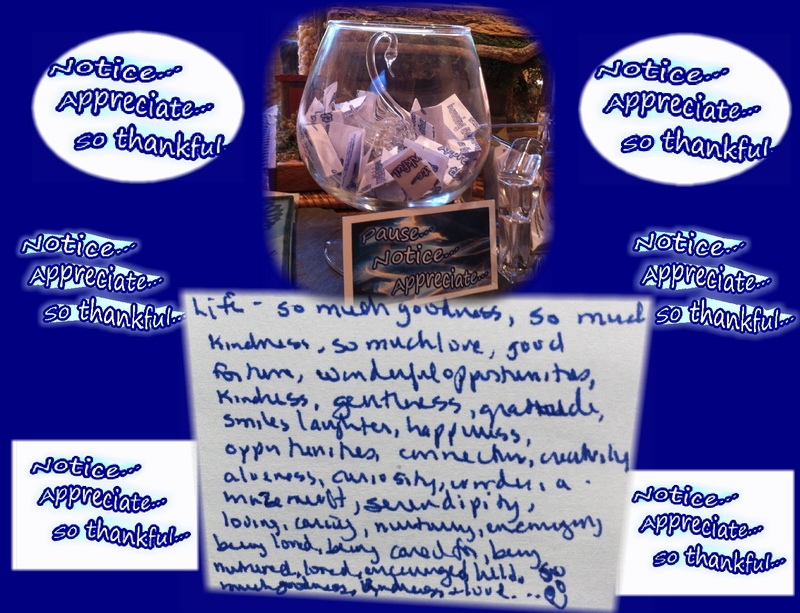 I put the swan on a little pedestal inside the jar, since it was almost covered up by “appreciations.” Jotting down little appreciations throughout the day is really special and leading to more awareness of the bounty of positives! another positive strategy, it seems…. This entry was posted in Appreciation, Encouragement, Gratitude, Happiness, Inspiration and tagged Appreciation, Awareness, Common Humanity, Encouragement, Generosity, Gratitude, Happiness, Inspiration, Intention, Life, Loving kindness, Mindfulness, Motivation, Persistence, Spirituality, Wisdom. Bookmark the permalink. No matter what size jar I could choose to fill with appreciation, I’m afraid it would always be full. Have a good day, Kathy! Another thought….a few months ago you left a comment for me….maybe I had doubted myself in a post or comment, I can’t remember….you made the suggestion that perhaps I might be more capable than I recognize or give myself credit for. Eric, I printed out your suggestion/comment and taped it up on the wall…to open my mind to that possibility. Eric, I think that is a possibility. Again, you are so tuned in to supporting others..thank you. I love what you’ve done here and the meaningfulness of your own jar. Next time I’m feeling “less than” I’m going to sit with your list, and my sweetie, and check off all the ones that I have or express. I think most of us would be surprised, to do this, and discover, how truly awesome we are! Marie, it took me several years before I would open my mind to thinking about positives about myself. I was encouraged to do that, but thought it sounded too self absorbed or too self centered. It took several years to understand/realize that the more I’m aware of positive qualities in myself, (and in others too) the happier I feel and the kinder and more generous I am to/with others and myself. I had doubted that, but now see there is validity in it. Your post was what finally got me to give the actual appreciation jar a try…to think it through and to write it down. (won’t the friend from Reflections be happily surprised when he gets out of his retreat in February….now that will be a surprise for him…all those years of encouraging and suggesting, and I finally follow your example/suggestion! ) I’m so happy that your own gratitude messages shifted your mood…maybe there’s more to this idea than we realize?…I think maybe so… ps..I just printed out more blank papers to write on…I was running out from the first “batch”… wow! Jampa is going to be very happy, so happy I was part of it too. 🙂 I think there is more to this gratitude thing for self and others. It’s amazingly healing, and I think it’s because it opens the heart, creates a softer space in us. When we are struggling the mind and body gets tighter. So…opening the heart and creating a softer space within…that would make sense…. I guess “goodness” might emerge from softening of body and mind…I think maybe so.